I have come to really like these Week in Review posts, thanks Meg for the link up! So I published five posts last week which feels huge for me right now because balancing event industry writing with my usual blog writing has been a bit harder to do these days. I sort of feel like I am getting the balance back but who really knows. Thanksgiving Week in Review < – Feels so long ago now! Favorite Breakfast & One Pan Dinner (WIAW) < – Still loving my English muffins & PB. Thinking Out Loud < – Great comments about Gilmore Girls and I must get that giant chocolate bar. Friday Favorites < – Sipping the Cinnamon Sugar Cookie coffee as I type! I mentioned in my workout recap from yesterday that I was planning to pick a Pure Barre workout to do yesterday morning. I ended up as I thought I would with the Pure Barre Pure Results Focus on Thighs Workout and once again surprised myself with how strong my legs have become! I am telling you, this easy looking position used to be so killer for my thighs but now I can really do it without stopping immediately! Let’s back up to Friday morning though. Friday morning brought me a leaking hot water tank which was an inconvenience but not a tragedy. The real tragedy of the morning was my son waking up to his phone not charged enough for a full day of school. Oh the horror. I know. I still don’t understand why the school allows these kids to use their cell phones so freely during the day anyway. Or how about how my son not only texts me from his phone from school but now texts me from his Apple watch?! The teachers haven’t caught on to that one just yet? What do they think he is doing touching his watch all day? Thankfully the maintenance team where I live is amazing and fast so they were at my house super quick to fix things for me. They had to replace my hot water tank and pull up some carpet (again, no big deal just annoying) so I took myself out to work from Panera while they were working in my house. 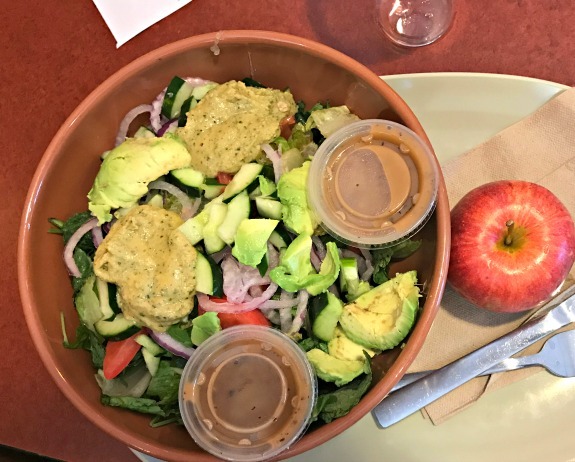 I had lunch at Panera while working and I creatively ordered the salad I wanted which sort of mimics the Hummus Power Bowl that they took off the menu. I ask for the house salad with the addition of hummus and avocado. Friday night my son and his friend wanted to go to The Cheesecake Factory which was more than fine with me. I am starting to walk past the PINK section of Victoria’s Secret in favor of the regular Victoria’s Secret underwear selection. Everything in Abercrombie & Fitch that would interest me looks so small in my size. Saturday we went to the Miracle Mile but I hardly got to walk the stores of the Mile because my son was with me and only wanted to go where he wanted to go which meant the Apple Store. Boring. Not boring was the bag of Trader Joe’s chocolate chips that I can always count on finding in the freezer at my parents’ house. Oh and we made sugar cookies last night in honor of National Cookie Day. Hanukkah falls around Christmas this year but I still whipped out the Dreidel cookie cutter to feel festive. The biggest thing to go on my life last week wasn’t really about my life but the life of my next door neighbor/best friend/Kate to my Allie co-star in real life friend Meaghan because she started a new big deal job. If you have been paying attention over the last few years of my blog, my friend Meaghan not only lives next door and is divorced like me with a daughter a year younger than my son but has also worked from home at the same time as me for the last three years. Flashback photo from when we were young and fun in 2011. I am so super happy and proud of her for landing this amazing job but it changes OUR lives! No longer is she working from home which means my life is upside down and affected too. While we both worked independently and most of the time I wouldn’t even see her during the day because our jobs are busy, we were still like coworkers in a way. It’s crazy weird for me not to see her car home when I run errands at lunch time, I can’t walk over during my walk in the middle of the day and she can’t come by when I need something hung up or fixed (she is handy like that). We can’t chat on the phone at random times and we can’t google things that need googling during our down time (okay so maybe that’s a good thing but gosh we have had some serious google moments while the kids were at school over the last few years). I will get used to it I am sure but for now, it’s a bit of a life adjustment. And on that note, it’s time for me to eat and run, have a great week! 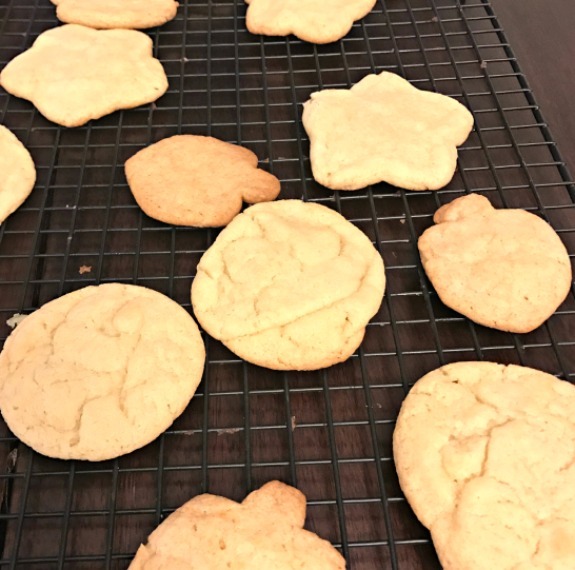 Do you like sugar cookies? Do you make them from scratch or from a mix? I always say I wish I could work from home but I think I would go a little crazy and probably not be very productive! I haven’t made sugar cookies in a long time. 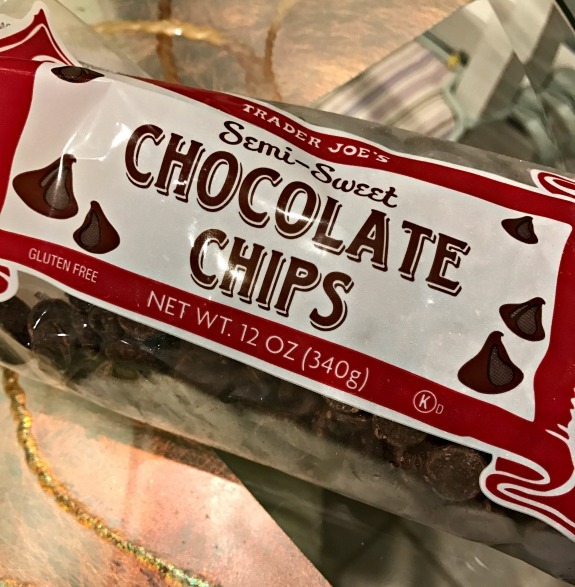 When we used to make them for Christmas I think we made them from a mix because its so much easier, and we spent our time making chocolate chip cookies from scratch. But it was always fun to decorate the sugar cookies! I am pretty productive actually, especially in the morning. by afternoon though, it can get hard! The kids can’t leave their cell phone now, exactly can’t leave their smart phone. I think go out, play sport will be good for them. I’m interested in your week review post, and want to do a post like that, it seems so fun!!! It’s been an adjustment for you….it’s been an adjustment for me. I don’t get those random calls throughout the day nor can I make them. Now I get official Northwell e-mails asking about Hofstra appointments for her doctors. Not liking it but so happy for her. You can call me if you are ever lonely. my day is so weird now! we really will need to talk on the phone to make up for the silence. I don’t like it but I am happy for her! Sorry to hear about you losing a co-worker! I don’t work from home regularly, but usually about once or twice a month. I just have my dog to keep my company while I work! I really miss her! my day feels so weird and quiet! love the frosting part of the cookies for sure. I missed the picture of that last night! When I met with Jake and Freddy’s high school support block teacher, he said that all the kids need cell phones now and that there are all these apps that help them with different elements of schooling! How to write a paragraph, math help, etc etc. I know that they mostly use it for shenanigans, but it’s still nice to know that there are some good elements to the whole cell phone thing. I use sugar cookie mix. I’m lazy! Sometimes I just mix in some chocolate chips and put the dough balls on the cookie sheet for chocolate chip cookies. SO easy. yeah I know they have the apps and things that they used for school. it’s so crazy though to me that they can really use their phones now yet we all got in trouble for passing notes lol. time has really changed! I’m sorry you lost your (sort of) coworker. That has to be hard. 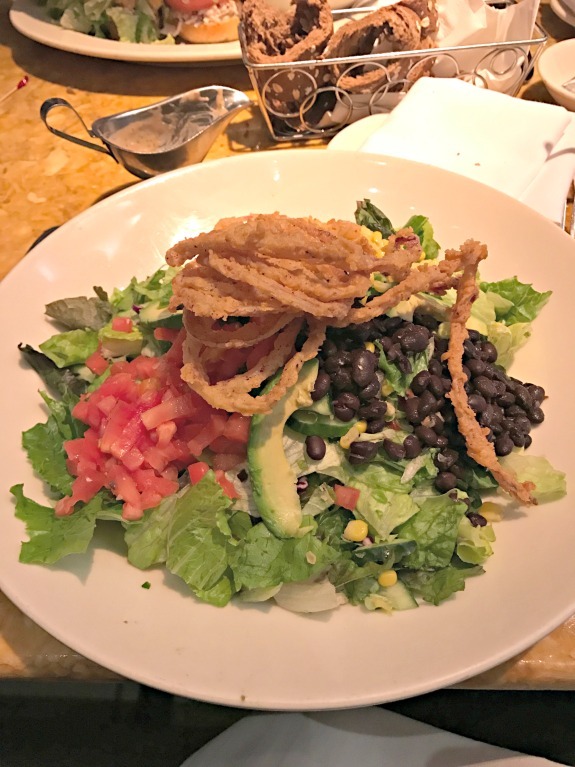 Every time I see your Cheesecake Factory Salad, I want one and today is no exception. The best thing I ate this weekend was a big bowl of rice and veggies last night. It had been too long and I savored every bite. P.S. I’m so glad you like the link up. I’m sorry – I hope you guys have lots of catch up time on the weekend! I work from home a lot and love it. I used to go into an office every day and then I started traveling regularly for my job which made my non-traveling days wfh days. Now … I’m at a company that’s super flexible and I only go into the office once or twice a week. It’s the best! Love sugar cookies! Yesterday was my first office day in a while and we had lunch catered from Potbelly’s. Their soft sugar cookies are SO good.